Blue Hills, Alaska's Promised Land portrays through a strong woman and her family, a window into old Alaska and the characters that made Alaska a living legend. Today, Alaska is losing both its pioneer elders and the rugged, untamed life that originally defined its mystique. 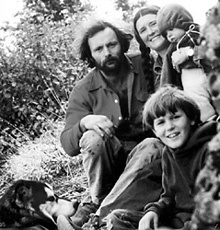 For forty years, Reb and Judy Ferguson have lived Alaska's wilderness life during the transition from yesterday's politically incorrect trappers to Alaska of today's global village. Blue Hills tracks both on a woman who decided in the 1960s to make her home in the wilderness, and through the Fergusons' canoe trips, on the major rivers and aboriginal people of Alaska, the Yukon Territory, and the Northwest Territories. Blue Hills is the transparent story of Judy Eskridge, a young, Midwestern woman who had a dream in 1968 she could not let go: a dream of a longed-for place where life was visionary, a dream she called "Blue Hills." Judy reached for a life of simplicity beyond the fracturing world of the 1960s. Once a raw frontier, America had evolved into a competitive superpower, convulsed by deep rifts. Before the 1968 Chicago Democratic Convention, the boiling point of the 1960s' revolution, Judy left Oklahoma for Alaska. As she journeyed up the Alcan Highway, Senator Robert Kennedy was shot, a signal to Judy that the world and the life she desired might no longer exist in the Lower 48. A secret door opened for her into a fresh country of opportunity, The Great Land: Alaska, the epitome of America's frontier origins. Blue Hills, Alaska's Promised Land portrays the Fergusons' world - the disappearing lifestyle of trapping - of the Native people and the Caucasian hunters and traders. Together the trappers, traders, and Natives were Alaska's grass-roots people who were "Old Alaska." Judy and Reb met in Alaska six years before the Trans-Alaska Pipeline began its transformation of traditional Alaska. 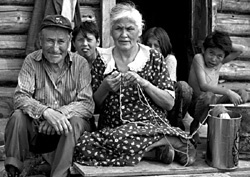 Carrying on the legacy of the old pioneers, Reb and Judy typified the Bush network from the Copper, Tanana, Yukon, and Kobuk Rivers of Alaska to the Porcupine and Mackenzie River Valleys in Canada. It is Alaska's personal story: the evolution from old to new, from the ice box to global neighborhood, the very human story of the woman and her family who lived it. 2nd edition, published April 2004, ISBN: 0-9716044-1-X, distributed by Voice of Alaska Publishing and by News Group. Parallel Destinies, a Christmas gift that, together with Blue Hills, makes an historical bridge telling the story of Delta and of the Tanana Valley from 1880-2003. Destinies is the story of John Hajdukovich and the Native people with whom he traded, from 1904-1965. John's life-long friend, Rika Wallen, was among the first farmers of the Tanana Valley. Destinies and its companion book, Blue Hills, show Delta as it was originally and continues: an international cross-roads at the top of the world. November 8th: Eielson Officers' Spouse Club Holiday Show, pending. November 14th-16th, Carlson Center, Holiday Marketplace, 401 Rudolph Court (in the foyer near the restrooms.) Fri: 12-8; Sat: 10-8; Sun: 10-5. November 22nd: Quota Crafters Bazaar at Pioneer Park, pending. November 28th and 29th: Holly Days/Fort Wainwright at Westmark Hotel, booth 46. Fri:5-9; Sat: 9-5. November 30th: Pioneer Park Holiday Celebration, 11-5, pending. December 6th: Delta Kiwanis bazaar, pending. "Ferguson's strong female voice presents the personalities, a microcosm of the earth's tribes, who were classical Alaska. The global changes of today effect every people, every nation and certainly, impact Alaska, but her beauty, culture, and ethnic variances will sustain her today as they have throughout the centuries." Professor Tamara Lincoln, Arctic Bibliographer and Rare Books Curator, Alaska and Polar Regions, Elmer E. Rasmuson Library, University of Alaska Fairbanks. "Alaska and the Yukon's destinies have always been intertwined as Judy's life is also inextricably braided with the North's evolution." Lise Schonewille, Mac's Fireweed Books, Whitehorse, Yukon Territory. "A salute to my mother, Pauline, and the Kobuk's Inupiaq Eskimos!" Lorry Schuerch, Kiana, Kobuk River. "I salute Judy's presentation of my family, the Yukon River; and the trappers who made the first Iditarod." Emmitt Peters, 1975 Champion and Record Setter Iditarod Trail and Dogsled Race. "Judy Ferguson describes in text and photos the lives of late twentieth century sourdoughs, making a valuable contribution to the Alaskan record. Through Ferguson's first-hand adventures, these unsung legends are brought alive." Anna Plager, State of Alaska Division of Parks, Fairbanks. "The story of an Alaskan Interior town, Delta Junction, the new site of the Ground-based Midcourse Defense, commonly referred to as 'Star Wars,' is itself a microcosm of Classical Alaska transitioning into today's Global Village." Sandy Hill, Delta-Greely School Principal. "A child of the 1960s, Ferguson left Oklahoma for the Great Land to raise a family in the wilderness. Blue Hills is a forty year epic, the transition of Judy and Alaska from Bush to global sophistication. Great photos!" Patricia Watts, Fairbanks Daily News-Miner, editor Heartland Magazine. "Blue Hills, Alaska's Promised Land has 205 high quality photos on 256 pages of high gloss paper. It is complete with an Alaska glossary, full color cover and side flaps. 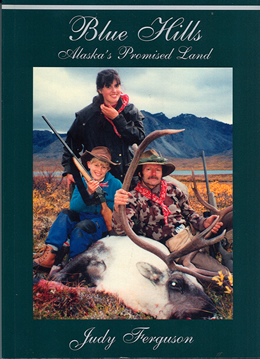 Strongly endorsed by Alaska's Interior Parks, University of Alaska Rasmuson Library, the Fairbanks Daily News-Miner, New Horizons, Barnes and Noble, Waldenbooks, the Delta-Greely School District, Blue Hills retails for $24.95 (please add shipping and handling for domestic-$6.50) and wholesales for $14.97. You may order Blue Hills, Alaska's Promised Land by writing to Judy at [email protected] We are happy to ship wherever needed."